A pedalboard allows a performer to create a ready-to-use chain of multiple pedals. Signal chain order: tuner, compressor, octave generator, wah-wah pedal, overdrive, distortion, fuzz, EQ and tremolo. An effects unit or pedal is an electronic or digital device that alters how a musical instrument or other audio source sounds. Some effects subtly "color" a sound, such as a reverb unit used on a low setting, while others transform it dramatically, such as a distortion pedal set to its maximum level. Musicians use effects units during live performances or in the studio, typically with electric guitar, electronic keyboard, electric piano or electric bass. While most frequently used with electric or electronic instruments, effects can also be used with acoustic instruments, drums and vocals. Examples of common effects units include wah-wah pedals, fuzzboxes and reverb units. Effects are built into amplifiers, housed in table top units, "stompboxes" and "rackmount units", or they are built into the instruments themselves. A stompbox or "pedal" is a small metal or plastic box placed on the floor in front of the musician and connected to the instrument and the instrument amplifier with patch cords. Typically, one or more on-off foot-operated switches control a device that provides only one or two effects, with many pedals having knobs for controlling the volume, tone and intensity of the effect. A rackmount device mounts on a standard 19-inch equipment rack and usually contains several types of effects. While there is currently no firm consensus on how to categorize effects, the following are seven common classifications: distortion/overdrive, dynamics (affecting loudness), filter, modulation, pitch/frequency, time-based and feedback/sustain. Guitarists derive their signature sound or "tone" from their choice of instrument, pickups, effects units, and guitar amp and from the different settings they use with their pickups, effects units and amp. An effects unit is also called an "effect box"; a pedal-style unit may be called a "stomp box" or "stompbox". Effects units are available in a variety of form factors. Stompboxes are usually the smallest, least expensive, and most rugged. Rackmount devices are generally more expensive and offer a wider range of functions. An effects unit can consist of analog or digital circuitry or a combination of the two. During a live performance, the effect is plugged into the electrical "signal" path of the instrument. In the studio, the instrument or other sound-source's auxiliary output is patched into the effect. Form factors are part of a studio or musician's outboard gear. Stompboxes usually lie on the floor or in a pedalboard to be operated by the user's feet. Typical simple stompboxes have a single footswitch, one to three potentiometers for controlling the effect, and a single LED that indicates if the effect is on. Complex stompboxes may have multiple footswitches, many knobs, additional switches, and an alphanumeric LED display that indicates the status of the effect with short acronyms (e.g., DIST for "distortion"). An "effects chain" or "signal chain" is formed by connecting two or more stompboxes. Effect chains are typically created between the guitar and the amp or between the preamplifier ("preamp") and the power amp. When a pedal is off or inactive, the electric audio signal coming into the pedal diverts onto a bypass, an unaltered "dry" signal that continues on to other effects down the chain. In this way, a musician can combine effects within a chain in a variety of ways without having to reconnect boxes during a performance. A "controller" or "effects management system" lets the musician create multiple effect chains, so they can select one or several chains by tapping a single switch. The switches are usually organized in a row or a simple grid. To preserve the clarity of the tone, it is most common to put compression, wah and overdrive pedals at the start of the chain; modulation (chorus, flanger, phase shifter) in the middle; and time-based units (delay/echo, reverb) at the end. When using many effects, unwanted noise and hum can be introduced into the sound. Some performers use a noise gate pedal at the end of a chain to reduce unwanted noise and hum introduced by overdrive units or vintage gear. Rackmounted effects are typically built in a metal chassis with "ears" designed to be screwed into a 19-inch rack that is standard to the telecommunication and computing and music technology industries. Rackmounted units are typically mounted in a road case, a tough plastic case with removable front and rear covers that can be latched on during transportation to protect the knobs and switches and then removed during performances. A rackmount unit may contain electronic circuitry identical to a stompbox's, although its circuits are typically more complex. Unlike stompboxes, rackmounts usually have several different types of effects. Rackmounts are most commonly used in recording studios and "front of house" live sound mixing situations, though professional musicians may use them in place of stompboxes. 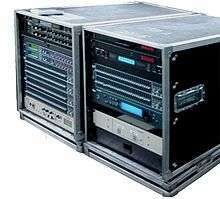 Rackmounts are controlled by knobs or switches on their front panel, and often by a MIDI digital control interface. During live performances, a musician can operate rackmounted effects using a "foot controller". "Shock mount" racks are designed for musicians who frequently move gear between venues. Devices that are less than 19 inches wide may use special "ear" adapters to mount on a rack. Effects are often incorporated into amplifiers and even some types of instruments. Electric guitar amplifiers typically have built-in reverb and distortion, while acoustic guitar and keyboard amplifiers tend to only have built-in reverb. The Fender Bandmaster Reverb amp, for example, had built-in reverb and vibrato. Since the 2000s, guitar amplifiers began having built-in multi-effects units or digital modeling effects. Bass amplifiers are less likely to have built-in effects, although some may have a compressor/limiter or fuzz bass effect. Instruments with built-in effects include Hammond organs, electronic organs, electronic pianos and digital synthesizers. Occasionally, acoustic-electric and electric guitars will have built-in effects, such as a preamp or equalizer. A multi-effects device (also called a "multi-FX" device) is a single electronics effects pedal or rackmount device that contains many different electronic effects. Multi-FX devices allow users to "preset" combinations of different effects, allowing musicians quick on-stage access to different effects combinations. Multi-effects units typically have a range of distortion, chorus, flanger, phaser and reverb effects. The most expensive multi-effects units may also have looper functions. A tabletop unit is a type of multi-effects device that sits on a desk and is controlled manually. One such example is the Pod guitar amplifier modeler. Digital effects designed for DJs are often sold in tabletop models, so that the units can be placed alongside a mixer, turntables and CD scratching gear. In 1964, Dave Davies (second from left), lead guitarist of The Kinks, famously achieved a distorted sound on "You Really Got Me" by slashing the cones of his guitar amplifier with a razor blade. The earliest sound effects were strictly studio productions. In the mid to late 1940s, recording engineers and experimental musicians such as Les Paul began manipulating reel-to-reel recording tape to create echo effects and unusual, futuristic sounds. Microphone placement ("miking") techniques were used in spaces with specially designed acoustic properties to simulate echo chambers. In 1948 DeArmond released the Trem-Trol, the first commercially available stand-alone effects unit. This device produced a tremolo by passing an instrument's electrical signal through a water-based electrolytic fluid. Most stand-alone effects of the 1950s and early 60s such as the Gibson GA-VI vibrato unit and the Fender reverb box, were expensive and impractical, requiring bulky transformers and high voltages. The original stand-alone units were not especially in-demand as many effects came built into amplifiers. The first popular stand-alone was the 1958 Watkins Copicat, a relatively portable tape echo effect made famous by the British band, The Shadows. Guitar amplifier built-in effects were the first effects that musicians used regularly outside the studio. From the late 1940s onward, the Gibson Guitar Corp. began including vibrato circuits in combo amplifiers. The 1950 Ray Butts EchoSonic amp was the first to feature the "slapback" echo sound, which quickly became popular with guitarists such as Chet Atkins, Carl Perkins, Scotty Moore, Luther Perkins, and Roy Orbison. By the 1950s, tremolo, vibrato and reverb were available as built-in effects on many guitar amplifiers. Both Premier and Gibson built tube-powered amps with spring reverb. Fender began manufacturing the tremolo amps Tremolux in 1955 and Vibrolux in 1956. Distortion was not an effect originally intended by amplifier manufacturers, but could often easily be achieved by "overdriving" the power supply in early tube amplifiers. In the 1950s, guitarists began deliberately increasing gain beyond its intended levels to achieve "warm" distorted sounds. Among the first musicians to experiment with distortion were Willie Johnson of Howlin' Wolf, Goree Carter, Joe Hill Louis, Ike Turner, Guitar Slim, and Chuck Berry. In 1954 Pat Hare produced heavily distorted power chords for several recordings (including James Cotton's Cotton Crop Blues"), creating "a grittier, nastier, more ferocious electric guitar sound," accomplished by turning the volume knob on his amplifier "all the way to the right until the speaker was screaming." Link Wray's 1958 recording "Rumble" inspired young musicians such as Pete Townshend of The Who, Jimmy Page of Led Zeppelin, Jeff Beck, Dave Davies of The Kinks, and Neil Young to explore distortion. Davies would famously doctor the speakers of his amp by slitting them with a razor blade to achieve a grittier guitar sound on the 1964 song "You Really Got Me". In 1966, the British company Marshall Amplification began producing the Marshall 1963, a guitar amplifier capable of producing the distorted "crunch" that rock musicians were starting to seek. The Fuzz Face effect pedal. The electronic transistor finally made it possible to cram the aural creativity of the recording studio into small, highly portable stompbox units. Transistors replaced vacuum tubes, allowing for much more compact formats and greater stability. The first transistorized guitar effect was the 1962 Maestro Fuzz Tone pedal, which became a sensation after its use in the 1965 Rolling Stones hit "(I Can't Get No) Satisfaction". Warwick Electronics manufactured the first wah-wah pedal, The Clyde McCoy, in 1967 and that same year Jim Morris of Kelsey-Morris Sound developed the first octave effect, which Jimi Hendrix named "Octavio". In 1968, Univox began marketing its Uni-Vibe pedal, an effect designed by noted audio engineer Fumio Mieda that mimicked the odd phase shift and chorus effects of the Leslie rotating speakers used in Hammond organs. The pedals soon became favorite effects of guitarists Jimi Hendrix and Robin Trower. Upon first hearing the Octavia, Hendrix allegedly rushed back to the studio and immediately used it to record the guitar solos on "Purple Haze" and "Fire". By the mid-1970s a variety of solid-state effects pedals including flangers, chorus pedals, ring modulators and phase shifters were available. Several Boss pedals connected together. 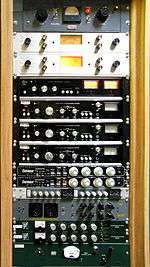 In the 1980s, digital rackmount units began replacing stompboxes as the effects format of choice. Often musicians would record "dry", unaltered tracks in the studio and effects would be added in post-production. The success of Nirvana's 1991 album Nevermind helped to re-ignite interest in stompboxes. Some grunge guitarists would chain several fuzz pedals together and plug them into a tube amplifier. Throughout the 1990s, musicians committed to a "lo-fi" aesthic such as J Mascis of Dinosaur Jr., Stephen Malkmus of Pavement and Robert Pollard of Guided by Voices continued to use analog effects pedals. Effects and effects units—stompboxes in particular—have been celebrated by pop and rock musicians in album titles, songs and band names. 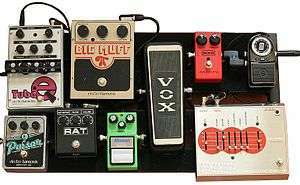 The Big Muff, a classic fuzzbox manufactured by Electro-Harmonix, is commemorated by the Depeche Mode song "Big Muff" and the Mudhoney EP Superfuzz Bigmuff. Nine Inch Nails, Pink Floyd, George Harrison, They Might Be Giants and Joy Division are among the many musicians who have referenced effects units in their music. Distortion effects create warm, gritty, and fuzzy sounds by "clipping" an instrument's audio signal, which distorts the shape of its wave form and adds overtones. Distortion effects are sometimes called "gain" effects, as distorted guitar sounds were first achieved by increasing the electric power supply, e.g. gain, to tube amplifiers. Distortion and overdrive: Distortion and overdrive units re-shape or "clip" an audio signal's wave form so that it has flattened peaks, creating "warm" sounds by adding harmonics or "gritty" sounds by adding inharmonic overtones. In tube amplifiers, distortion is created by compressing the instrument's out-going electrical signal in vacuum tubes or "valves". Distortion pedals produce perfectly flattened peaks or "hard" clipping. Overdrive pedals produce "soft” tube-like distortion by compressing the sine wave without completely flattening it. Much like tube amps, overdrive units produce "clean" sounds at quieter volumes and distorted "warm" sounds at louder volumes. Distortion and overdrive pedals may either be transistor-based or digital. Distortion and overdrive effects: Boss DS-1 Distortion, Ibanez Tube Screamer, Marshall ShredMaster, MXR Distortion +, Pro Co RAT. Fuzz: A fuzz pedal or "fuzzbox" is a type of overdrive pedal that clips a sound-wave until it is nearly a squarewave, resulting in a heavily distorted or "fuzzy" sound. Fuzzboxes may contain frequency multiplier circuitry to achieve a harsh timbre by adding complex harmonics. The Rolling Stones' "(I Can't Get No) Satisfaction" greatly popularized the use of fuzz effects. Fuzz bass (also called "bass overdrive") is a style of playing the electric bass that produces a buzzy, overdriven sound via a tube or transistor amp or by using a fuzz or overdrive pedal. Fuzz effects: Arbiter Fuzz Face, Electro-Harmonix Big Muff, Shin-ei Companion FY-2, Univox Super-Fuzz, Vox Tone Bender, Z.Vex Fuzz Factory. A rack of rackmount audio compressors in a recording studio. From top to bottom: Retro Instruments/Gates STA level; Spectra Sonic; Dbx 162; Dbx 165; Empirical Labs Distressor; Smart Research C2; Chandler Limited TG1; Daking FET (91579); and Altec 436c. Also called volume and amplitude effects, dynamics effects modify the volume of an instrument. Dynamics effects were among the first effects introduced to guitarists. Boost/volume pedal: A boost or "clean boost" amplifies the volume of an instrument by increasing the amplitude of its audio signal. These units are generally used for "boosting" volume during solos and preventing signal loss in long "effects chains". A guitarist switching from rhythm guitar to lead guitar may use a boost to increase the volume of his or her solo. Treadle based volume pedals are often also used to create swelling effects by removing the attack of a note or chord, as popularised by pedal steel guitar players. Volume effects: Electro-Harmonix LPB-1, Fender Volume Pedal, MXR Micro Amp, Ernie Ball Volume Pedal. Compressor: Compressors make loud sounds quieter and quiet sounds louder by decreasing or "compressing" the dynamic range of an audio signal. A compressor is often used to stabilize volume and smooth a note's "attack" by dampening its onset and amplifying its sustain. A compressor can also function as a limiter with extreme settings of its controls. Compressor effects: Keeley Compressor, MXR Dyna Comp, Boss CS-3 Compression Sustainer. Noise gate effects: Boss NS-2 Noise Suppressor. Filter effects alter the frequency content of an audio signal that passes through them by either boosting or weakening specific frequencies or frequency regions. Equalizer: An equalizer is a set of linear filters that strengthen ("boost") or weaken ("cut") specific frequency regions. While basic home stereos often have equalizers for two bands, to adjust bass and treble, professional graphic equalizers offer much more targeted control over the audio frequency spectrum. Audio engineers use highly sophisticated equalizers to eliminate unwanted sounds, make an instrument or voice more prominent, and enhance particular aspects of an instrument's tone. Equalizer effects: Boss GE-7 Equalizer, MXR 10-band EQ Pedal. Talk box: A talk box directs the sound from an electric guitar or synthesizer into the mouth of a performer using a tube, allowing him or her to shape the sound into vowels and consonants with his or her mouth. The modified sound is then picked up by a microphone. In this way the guitar is able to "talk". 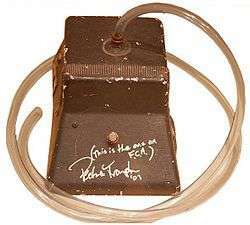 Some famous uses of the talkbox include Bon Jovi's "Livin' on a Prayer", Stevie Wonder's "Black Man", Mötley Crüe's "Kickstart My Heart", Joe Walsh's "Rocky Mountain Way", Alice in Chains's "Man in the box" and Peter Frampton's "Show Me the Way". Talk boxes: Dunlop HT1 Heil Talk Box, Rocktron Banshee. Wah-wah: A wah-wah pedal creates vowel-like sounds by altering the frequency spectrum produced by an instrument—i.e., how loud it is at each separate frequency—in what is known as a spectral glide or "sweep". The device is operated by a foot treadle that opens and closes a potentiometer. Wah-wah pedals are often used by funk and rock guitarists. Wah effects: Dunlop Cry Baby, Morley Power Wah, Musitronics Mu-Tron III. Modulation, in general electronics, means the altering of signal strength. In audio devices, modulation is a control feature that varies the strength of some effect over time to alter tonal properties. Some modulation effects mix ("modulate") an instrument's audio signal with a signal generated by the effect called a carrier wave. Other modulation effects split an instrument's audio signal in two, altering one portion of the signal and mixing it with the unaltered portion. Chorus: Chorus pedals mimic the effect choirs and string orchestras produce naturally, by having slight variations in timbre and pitch, by mixing sounds with slight differences in timbre and pitch. A chorus effect splits the instrument-to-amplifier audio signal, and adds a slight delay and frequency variations or "vibrato" to part of the signal while leaving the rest unaltered. A well-known usage of chorus is the lead guitar in "Come As You Are" by Nirvana. Chorus effects: Boss CE-1 Chorus Ensemble, Electro-Harmonix Small Clone, TC Electronic Stereo Chorus. Flanger: A flanger creates a "whooshing" "jet plane" or "spaceship" sound, simulating a studio effect that was first produced by recording a track on two synchronized tapes and periodically slowing one tape by pressing the edge of its reel (the "flange"). When the two tapes' audio signals are later mixed, a comb filter effect can be heard. Flanger units add a variably delayed version of the audio signal to the original or signal, creating a comb filter or Doppler effect. Some famous uses of flanger effects include "Walking on the Moon" by The Police, the intro to "Ain't Talkin' 'Bout Love" by Van Halen, and "Barracuda" by Heart. Flanger effects: Electro-Harmonix Electric Mistress, MXR Flanger, Boss BF-3 Flanger. Phaser: A phaser or "phase shifter" creates a slight rippling effect—amplifying some aspects of the tone while diminishing others—by splitting an audio signal in two and altering the phase of one portion. Three well-known examples of phaser are the two handed tapping part on the Van Halen instrumental "Eruption" and the keyboard parts on Billy Joel's "Just the Way You Are" and Paul Simon's "Slip Slidin' Away". Phase shift effects: Electro-Harmonix Small Stone, MXR Phase 90, Univox Uni-Vibe. Ring modulator: A ring modulator produces a resonant, metallic sound by mixing an instrument's audio signal with a carrier wave generated by the device's internal oscillator. The original sound wave is suppressed and replaced by a "ring" of inharmonic higher and lower pitches or "sidebands". A notable use of ring modulation is the guitar in the Black Sabbath song "Paranoid". Ring modulator effects: moogerfooger MF-102 Ring Modulator. Tremolo: A tremolo effect produces a slight, rapid variation in the volume of a note or chord. The "tremolo effect" should not be confused with the misleadingly-named "tremolo bar", a device on a guitar bridge that creates a vibrato or "pitch-bending" effect. In transistorized effects, a tremolo is produced by mixing an instrument's audio signal with a sub-audible carrier wave in such a way that generates amplitude variations in the sound wave. Tremolo effects are built-in effects in some vintage guitar amplifier. The guitar intro in the Rolling Stones' "Gimme Shelter" features a tremolo effect. Tremolo effects: Demeter TRM-1 Tremulator, Fender Tremolux. Vibrato: Vibrato effects produce slight, rapid variations in pitch, mimicking the fractional semitone variations produced naturally by opera singers and violinists when they are prolonging a single note. Vibrato effects often allow the performer to control the rate of the variation as well as the difference in pitch (e.g. "depth"). A vibrato with an extreme "depth" setting (e.g., half a semitone or more) will produce a dramatic, ululating sound. In transistorized effects, vibrato is produced by mixing an instrument's audio signal with a carrier wave in such a way that generates frequency variations in the sound wave. Guitarists often use the terms "vibrato" and "tremolo" misleadingly. A so-called "vibrato unit" in a guitar amplifier actually produces tremolo, while a "tremolo arm" or "whammy bar" on a guitar produces vibrato. Vibrato effects: Boss VB-2 Vibrato. Pitch/frequency effects modify pitch by altering the frequency of a sound wave or adding new harmonies. Pitch shifter and harmonizer: A pitch shifter (also called an "octaver" for effects that shift pitch by an octave) raises or lowers (e.g. "transposes") each note a performer plays by a pre-set interval. For example, a pitch shifter set to increase the pitch by a fourth will raise each note four diatonic intervals above the notes actually played. Simple pitch shifters raise or lower the pitch by one or two octaves, while more sophisticated devices offer a range of interval alterations. A pitch shifter can be used by an electric guitarist to play notes that would normally only be available on an electric bass. As well, a bass player with a four string electric bass can use an octave pedal to obtain low notes that would normally only be obtainable with a five-string bass with a low "B" string. A harmonizer is a type of pitch shifter that combines the altered pitch with the original pitch to create a two or more note harmony. Some hamonizers are able to create chorus-like effects by adding very tiny shifts in pitch. Pitch shift effects: DigiTech Whammy, Electro-Harmonix POG. Time-based effects delay the sound signal or adds echos. Delay/echo: Delay/echo units produce an echo effect by adding a duplicate instrument-to-amplifier electrical signal to the original signal at a slight time-delay. The effect can either be a single echo called a "slap" or "slapback," or multiple echos. A well-known use of delay is the lead guitar in the U2 song "Where the Streets Have No Name". Delay effects: Boss DD-3 Digital Delay, MXR Carbon Copy, Electro-Harmonix Deluxe Memory Man, Line 6 DL4, Roland RE-201. Looper pedal: A looper pedal or "phrase looper" allows a performer to record and later replay a phrase or passage from a song. Loops can be created on the spot during a performance (live looping) or they can be pre-recorded. By using a looper pedal, a singer-guitarist in a one man band can play the backing chords to a song, loop them with the pedal, and then do a guitar solo over the chords. Some units allow a performer to layer multiple loops. The first loop effects were created with reel-to-reel tape using a tape loop. High-end boutique tape loop effects are still used by some studios who want a vintage sound. Digital loop effects recreate this effect using an electronic memory. Looper effects: Boss RC-30 Loop Station. Reverb: Reverb units simulate sounds produced in a finite acoustic space by creating a large number of echoes that gradually fade or "decay". One early technique for creating a reverb effect was to send an amplified signal of the music to room with reflective surfaces, such as a tile bathroom, and then record the natural reverberations. A plate reverb system uses an electromechanical transducer to create vibrations in a plate of metal. Spring reverb systems, which are often used in guitar amplifiers, use a transducer to create vibrations in a spring. Digital reverb effects use various signal processing algorithms to create the reverb effect, often by using multiple feedback delay circuits. Rockabilly and surf guitar are two genres that make heavy use of reverb. Reverb effects: Electro-Harmonix Holy Grail, Fender Reverb Unit. Audio feedback: Audio feedback is an effect produced when amplified sound is picked up by a microphone or guitar pickup and played back through an guitar amplifier, initiating a "feedback loop". Feedback that occurs from a vocal mic into a PA system is usually avoided. However, in some styles of rock music, electric guitar players intentionally create feedback by playing their instrument directly in front of a heavily amplified, distorted guitar amplifier's speaker enclosure. The creative use of feedback effects was pioneered by guitarists such as Jimi Hendrix in the 1960s. This technique creates sustained, high-pitched overtones and unusual sounds not possible through regular playing techniques. Guitar feedback effects can be difficult to perform, because it is difficult to determine the sound volume and guitar position relative to a guitar amp's loudspeaker necessary for achieving the desired feedback sound. Guitar feedback effects are used in a number of rock genres, including psychedelic rock, heavy metal music and punk rock. EBow is a brand name of Heet Sound Products, of Los Angeles, California, for the original type of small handheld resonator, invented by Greg Heet. The EBow can make a note on an electric guitar string resonate continuously, creating an effect that sounds similar to a bowed violin note. The resonator uses a pickup - inductive string driver - feedback circuit, including a sensor coil, driver coil, and amplifier, to induce forced string resonance. The Ebow brand resonator is monophonic, and drives only one string at a time; Other handheld guitar and bass resonators on the market, manufactured under the tradename SRG, produced by Aescher Europa, in Germany, are available in both monophonic and polyphonic models, which include multiple onboard trigger switch effects, such as HPF (high pass filter) for enhancing harmonics and producing feedback effects, and LPF (low pass filter), producing a bass boost with a cello sound on heavy gauge strings. Later EBow models, such as the plus Ebow, contain a mode slide switch on the back, which allows the player to either produce just sustain or overtone feedback in addition to sustain. Many compressor pedals are often also marketed as "sustainer pedals". As a note is sustained, it loses energy and volume due to diminishing vibration in the string. The compressor pedal boosts its electrical signal to the specified dynamic range, slightly prolonging the duration of the note. This, combined with heavy distortion and the close proximity of the guitar and the speaker cabinet, can lead to infinite sustain at higher volumes. Envelope follower: An envelope follower activates an effect once a designated volume is reached. One effect that uses an envelope follower is the auto-wah, which produces a "wah" effect depending on how loud or soft the notes are being played. Guitar amplifier modeling: Amplifier modeling is a digital effect that replicates the sound of various amplifiers, most often analog "tube" amps. Sophisticated modeling effects can simulate different types of speaker cabinets (e.g., the sound of an 8x10" cabinet) and miking techniques. 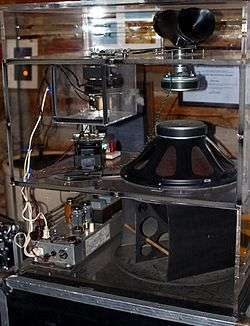 A rotary speaker simulator mimics the doppler and chorus effect sound of a vintage Leslie speaker system by replicating its volume and pitch modulations, overdrive capacity and phase shifts. Pitch correction/vocal effects: Pitch correction effects use signal-processing algorithms to re-tune faulty intonation in a vocalist's performance  or create unusual vocoder-type vocal effects. One of the best known examples of this is Autotune, a program which can be used to both correct pitch, and add vocal effects. Simulators: Simulators enable electric guitars to mimic the sound of other instruments such as acoustic guitar, electric bass and sitar. Pick up simulators used on guitars with single-coil pick ups replicate the sound of guitars with humbucker pick ups, or vice versa. A de-fretter is a bass guitar effect that simulates the sound of a fretless bass. The effect uses an envelope-controlled filter and voltage-controlled amplifier to "soften" a note's attack both in volume and timbre. Rotating speakers are specially constructed amplifier/loudspeakers used to create special audio effects using the Doppler effect by rotating the speakers or a sound-directing duct. The rotating speaker creates a chorus-type effect. Named after its inventor, Donald Leslie, it is particularly associated with the Hammond organ but is used with a variety of instruments as well as vocals. The Hammond/Leslie combination has become an element in many genres of music. The Leslie Speaker and the Hammond Organ brands are currently owned by Suzuki Musical Instrument Corporation. The stompbox that simulates this effect is the Uni-Vibe pedal. 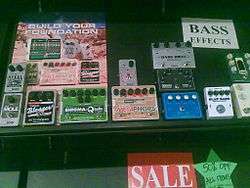 A selection of bass effect pedals at a music store. Bass effects are electronic effects units that are designed for use with the low pitches created by an electric bass or for an upright bass used with a bass amp or PA system. Two examples of bass effects are fuzz bass and bass chorus. Some bass amplifiers have built-in effects, such as overdrive or chorus. Upright bassists in jazz, folk, blues and similar genres may use a bass preamplifier, a small electronic device that matches the impedance between the piezoelectric pickup and the amp or PA system. Bass preamps also allow for the gain of the signal to be boosted or cut. Some models also offer equalization controls, a compressor, and a DI box connection. Boutique pedals are designed by smaller, independent companies and are typically produced in limited quantities. Some may even be hand-made, with hand-soldered connections. These pedals are mainly distributed online or through mail-order, or sold in a few music stores. They are often more expensive than mass-produced pedals and offer non-standard features such as true-bypass switching, higher-quality components, innovative designs, in-house-made knobs and hand-painted artwork or etching. Some boutique companies focus on re-creating classic or vintage effects. Some boutique pedal manufacturers include: Analog Man, BJFE, Pete Cornish, Emlyn Crowther, Death By Audio, Devi Ever, Robert Keeley, Roger Linn, Roger Mayer, Strymon, T-Rex Engineering, ToadWorks and Z.Vex Effects. There is also a niche market for modifying or "modding" effects. 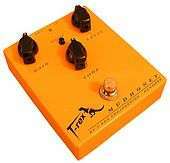 Typically, vendors provide either custom modification services or sell new effects pedals they have already modified. The Ibanez Tube Screamer, Boss DS-1, Pro Co RAT and DigiTech Whammy are some of the most often-modified effects. Common modifications include value changes in capacitors or resistors, adding true-bypass so that the effect's circuitry is no longer in the signal path, substituting higher-quality components, replacing the unit's original operational amplifiers (op-amps), or adding functions to the device, such as allowing additional control of some factor or adding another output jack. Not all stompboxes and rackmounted electronic devices designed for musicians are effects. Strobe tuner and regular electronic tuner pedals indicate whether a guitar string is too sharp or flat. Rackmount power conditioner devices deliver a voltage of the proper level and characteristics to enable equipment to function properly (e.g., by providing transient impulse protection). A rackmounted wireless receiver unit is used to enable a guitarist or bassist to move around on stage without being connected to a cable. A footswitch pedal such as the "A/B" pedal routes a guitar signal to an amplifier or enables a performer to switch between two guitars, or between two amplifiers. Guitar amplifiers and electronic keyboards may have switch pedals for turning built-in reverb and distortion effects on and off; the pedals contain only a switch, with the circuitry for the effect being housed in the amplifier chassis. Some musicians who use rackmounted effects or laptops employ a MIDI controller pedalboard or armband remote controls to trigger sound samples, switch between different effects or control effect settings. A pedal keyboard is a foot-operated keyboard typically used to play bass lines. ↑ Horne, Greg (2000). Complete Acoustic Guitar Method: Mastering Acoustic Guitar c. Alfred Music. p. 92. ↑ Yakabuski, Jim (2001). Professional Sound Reinforcement Techniques: Tips and Tricks of a Concert Sound Engineer. Hal Leonard. p. 139. ↑ Clement, Vivian (2007). How to Succeed As a Female Guitarist: The Essential Guide for Working in a Male-dominated Industry. Alfred Music. p. 30. ↑ Clement, V (2007). How to Succeed As a Female Guitarist. Alfred Music. p. 30. 1 2 "The Art of the Stompbox". The Museum of Making. 2010. Retrieved 13 September 2010. ↑ "Guitar effects". Trip Atlas. Retrieved 18 September 2010. 1 2 Clement, V (2007). How to Succeed As a Female Guitarist, Alfred Music. p. 30–31. ↑ Gibson, Bill (2007). The Ultimate Live Sound Operator's Handbook. Hal Leonard. p. 366. ↑ McCormick, Tim; Rumsey, Francis (2009). Sound and Recording. Focal Press. p. 131. ↑ Editors, Guitar Player Magazine (2001). How to Play Guitar: The Basics & Beyond. Hal Leonard. p. 82. ↑ Mangum, Eric; Stubbs, Dean (2000). Dod Presents 100 Superstar Guitar Sounds on a Stompbox Budget. Hal Leonard. p. 8. ↑ Egnater, Bruce "Bruce Egnater on Effects Loops" Guitar Player, December, 2009. ↑ Kahn, Scott (2011). Modern Guitar Rig: The Tone Fanatic's Guide to Integrating Amps and Effects. MusicPro Guides. Milwaukee: Hal Leonard Corporation. p. 146. ISBN 1-4234-9944-1. ↑ Rogers, Jerry. Your Band's First Gig: Getting The Sound Right. Retrieved 10 September 2010. ↑ Ashton, Adrian (2006). The Bass Handbook. Hal Leonard. pp. 91–92. ↑ Levitin, Dan (1992). From Demo Tape to Record Deal: Handy Guide. Alfred Music. p. 26. ISBN 0-88284-494-6. ↑ Ashton, Adrian (2006). The Bass Handbook. Hal Leonard. p. 92. ↑ Eiche. Jon; Fliegler, Ritchie (1993) Amps! : The Other Half of Rock 'n' Roll, Hal Leonard. p. 25, 40, 52, 74. ↑ Hunter, Dave (2004). Guitar Effects Pedals: The Practical Handbook. Hal Leonard. p. 125. ↑ Bartlett, Bruce; Bartlett, Jenny (2008). Practical Recording Techniques: The Step-by-step Approach to Professional Audio Recording. Focal Press. p. 226. ↑ Tianen, Dave (13 August 2009). "The Wizard Of Waukesha". Retrieved 13 September 2010. ↑ Roads, Curtis (1996). The Computer Music Tutorial. MIT Press. pp. 437, 476. ↑ Chester, Paul. "Acoustic Guitar - Early Pickups". Retrieved 3 January 2011. ↑ Hunter, D (2004). Guitar Effects Pedals: The Practical Handbook. Hal Leonard. p. 11–12. ↑ Hunter, D (2004). Guitar Effects Pedals: The Practical Handbook. Hal Leonard. p. 11–13. ↑ Robert Palmer, "Church of the Sonic Guitar", pp. 13–38 in Anthony DeCurtis, Present Tense, Duke University Press, 1992, p. 19. ISBN 0-8223-1265-4. ↑ DeCurtis, Anthony (1992). Present Tense: Rock & Roll and Culture (4. print. ed.). Durham, N.C.: Duke University Press. ISBN 0-8223-1265-4. His first venture, the Phillips label, issued only one known release, and it was one of the loudest, most overdriven, and distorted guitar stomps ever recorded, "Boogie in the Park" by Memphis one-man-band Joe Hill Louis, who cranked his guitar while sitting and banging at a rudimentary drum kit. ↑ Miller, Jim (1980). The Rolling Stone illustrated history of rock & roll. New York: Rolling Stone. ISBN 0-394-51322-3. Retrieved 5 July 2012. Black country bluesmen made raw, heavily amplified boogie records of their own, especially in Memphis, where guitarists like Joe Hill Louis, Willie Johnson (with the early Howlin' Wolf band) and Pat Hare (with Little Junior Parker) played driving rhythms and scorching, distorted solos that might be counted the distant ancestors of heavy metal. ↑ Aswell, Tom (2010). Louisiana Rocks! The True Genesis of Rock & Roll. Gretna, Louisiana: Pelican Publishing Company. pp. 61–5. ISBN 1-58980-677-8. ↑ Robert Palmer, "Church of the Sonic Guitar", pp. 13–38 in Anthony DeCurtis, Present Tense, Duke University Press, 1992, pp. 24–27. ISBN 0-8223-1265-4. ↑ Koda, Cub. "Pat Hare". AllMusic. Retrieved 25 January 2010. ↑ Gracyk, Theodore (1996). Rhythm and Noise: An Aesthetics of Rock. I.B.Tauris. pp. 121–123. ↑ A. J., Millard (2004). The Electric Guitar: A History of an American Icon. JHU Press. p. 136. ↑ Doyle, Michael (1993). The History of Marshall: The Illustrated Story of "The Sound of Rock". Hal Leonard Corporation. pp. 28–33. ISBN 0-7935-2509-8. ↑ "The Art of the Stompbox". 2010. Retrieved 13 September 2010. ↑ "FuzzEffect: The Fuzz Story and Photos". Retrieved 13 September 2010. ↑ Molenda, Mike; Pau, Les (2007). The Guitar Player Book: 40 Years of Interviews, Gear, and Lessons from the World's Most Celebrated Guitar Magazine. Hal Leonard. p. 222. ↑ Hunter, D (2004). Guitar Effects Pedals: The Practical Handbook. Hal Leonard. p. 11–15. ↑ Thomas E. Oberheim (May 1970). "A Ring Modulator Device for the Performing Musician". AES Convention 38: 708. ↑ "Serve the Servants: Unlocking the Secrets of Grunge Guitar". Gibson.com. 2011-04-26. Retrieved 2016-04-01. ↑ "Big Muff Pi Distortion/Sustainer". Electro-Harmonix. Retrieved 18 September 2010. ↑ Menasche, Emile D. (2007). Home Studio Clinic: A Musician's Guide to Professional Recording. Hal Leonard. p. 80. 1 2 Ross, Michael (1998). Getting Great Guitar Sounds. Hal Leonard. p. 39. 1 2 3 Aikin, Jim (2004). Power Tools for Synthesizer Programming, Hal Leonard. p. 171. ↑ Zölzer, Udo; Amatriain, Xavier (2002). DAFX: Digital Audio Effects. John Wiley and Sons. p. 117. ↑ Platt, Charles (2009). MAKE: Electronics: Learning Through Discovery O'Reilly Media. p. 257. ↑ Holmes, Thom (2006). The Routledge Guide to Music Technology. CRC Press. p. 177. ISBN 0-415-97324-4. ↑ Manning, Peter (2004). Electronic and Computer Music. Oxford University Press US. p. 170. ISBN 0-19-514484-8. ↑ Hunter, Dave (2004). Guitar Effects Pedals: The Practical Handbook. Hal Leonard. p. 23. 1 2 Reese, David; Gross, Lynne; Gross, Brian (2009). Audio Production Worktext: Concepts, Techniques, and Equipment. Focal Press. p. 149. ISBN 0-240-81098-8. 1 2 Hunter, D (2004). Guitar Effects Pedals: The Practical Handbook. Hal Leonard. p. 23. ↑ Louie, Gary J.; White, Glenn D. (2005). The Audio Dictionary, University of Washington Press. p. 171. ↑ Flans, Robyn "Classic Tracks: Phil Collins' 'In the Air Tonight' ", Mix, 1 May 2005. ↑ Rudolph, Thomas; Leonard, Vincent (2001) Recording in the Digital World: Complete Guide to Studio Gear and Software, Hal Leonard . p. 192. ↑ Strong, Jeff (2005). PC Recording Studios for Dummies. For Dummies. p. 25. ↑ Dyers, Jon (21 March 2008). "The Talkbox Will Never Die: A Talkbox Playlist". Dyers. Retrieved 20 September 2010. ↑ McCarron, Brett. "The Talkbox FAQ". Retrieved 10 September 2010. ↑ Denton, Dailey J. (2011). Electronics for Guitarists. Springer. p. 183. 1 2 Schneider, John (1985). The Contemporary Guitar, University of California Press. p. 202. 1 2 Zölzer, Udo; Amatriain, Xavier (2002). DAFX: Digital Audio Effects. John Wiley and Sons. p. 76. 1 2 Coulter, Doug. (2001). Digital Audio Processing, Focal Press. p. 271. ↑ Perkins, Chad (2009). The After Effects Illusionist: All the Effects in One Complete Guide. Focal Press. p. 37. ISBN 0-240-81145-3. ↑ Kurasaki, Kurt (2005). Power Tools for Reason 3.0: Master the World's Most Popular Virtual Studio. Hal Leonard. p. 169. ↑ Louie, G; White, G (2005). The Audio Dictionary, University of Washington Press. p. 153. ↑ "Electro Harmonix Deluxe Electric Mistress Review". Internet Guitar Database. Retrieved 19 September 2001. ↑ Louie, G; White, G. (2005). The Audio Dictionary, University of Washington Press. p. 288. ↑ McNamee, David "Hey, What's That Sound: Ring Modulators", The Guardian, London, 9 November 2009. ↑ Trolet, Jean-Pierre. "Rolling Stones – Gimme Shelter tab". Retrieved 9 September 2010. ↑ Mangum, E; Stubbs, D (2000). Dod Presents 100 Superstar Guitar Sounds on a Stompbox Budget. Hal Leonard. p. 94. ↑ Fischer, Peter (2000), Rock Guitar Secrets, Mel Bay. p. 164. ↑ Izhaki, Roey (2007). Mixing Audio: Concepts, Practices and Tools, Focal Press. p. 470. ↑ Hubner, David; Runstein, Robert (2009). Modern Recording Techniques, Focal Press. p. 508. ↑ "Starting Point". LooperMusic.com. Retrieved 2015-12-28. ↑ Hopper, Jessica (2009). The Girl's Guide to Rocking Out. Workman Publishing. p. 34. ↑ Hubner, D; Runstein, R (2009). Modern Recording Techniques, Focal Press. p. 508. ↑ Wright, Ed (2007). Left-Handed History of the World, Murdoch Books. p. 209. ↑ Amelar, Chris (1997). The Guitar F/X Cookbook, Hal Leonard. p. 41. ↑ Hunter, Dave (2004). Guitar Effects Pedals: The Practical Handbook. Hal Leonard. p. 25. ↑ White, G, Louie, G (2005). The Audio Dictionary Instruments. University of Washington Press. p. 138. ↑ Hopper, J (2009). The Girl's Guide to Rocking Out. Workman Publishing. p. 33. ↑ Bartlett, B; Bartlett, J (2008). Practical Recording Techniques: The Step-by-step Approach to Professional Audio Recording. Focal Press. p. 226. ↑ Brice, Richard (2001). Music Engineering, Newnes. p. 413. ↑ "Boss GT-8 Floor Guitar Effects Processor". Retrieved 10 September 2010. ↑ "Batt-O-Meter : Where to Buy". •Keith McMillen Instruments. Retrieved 18 September 2010. ↑ Hunter, Dave (2004). Guitar Effects Pedals: The Practical Handbook. Hal Leonard. p. 204. ↑ "What is True Bypass?". Dunlop News. Retrieved 18 September 2010. 1 2 Moraga, Christian. "Mod.It.Yourself (M.I.Y) Parts 1 – 3". Effects Bay. Retrieved 18 September 2010. ↑ "Modifications". cubisteffects. Retrieved 18 September 2010. ↑ "Selected Stompbox Schematics". DIY Stompbox. Retrieved 18 September 2010. ↑ Platt, Charles "Stompbox Basics: Tremolo and Fuzz" MAKE Magazine, 9 September 2008. ↑ Chappell, Jon; Phillips, Mark (2005). Guitar for Dummies, For Dummies. p. 291. ↑ Chappell, Jon; Phillips, Mark (2005). Guitar for Dummies, For Dummies. p. 187. ↑ Delaney, Martin (2007). Ableton Live 6 Tips and Tricks. PC Publishing. p. 5.